The Greater Toronto Airports Authority (GTAA) is moving ahead with plans for a regional transit centre to connect the airport area to key employment and residential areas throughout the Greater Golden Horseshoe. In addition to serving as a regional transportation centre, it would also be home to airport passenger processing, including security screening. GTAA President and CEO, Howard Eng, will today unveil preliminary concept plans for the transit centre at the Brampton Board of Trade’s State of the City event with Mayor Linda Jeffrey and Brampton Board of Trade Chair Evan Moore. The area around Toronto Pearson is the second largest employment zone in Canada after downtown Toronto according to NEPTIS Research Foundation. More than 300,000 people work in the zone that includes parts of Brampton, Mississauga, and Toronto. Among the sectors located in the Airport Employment Zone are construction and logistics, but also financial and business services. NEPTIS reports that there are more financial services related jobs located around the airport than all the jobs located in North York. Due to the lack of transit in the area, NEPTIS found that the area generates more than 1 million car trips daily, more trips than traveling to and from downtown Toronto. “Location matters and Toronto Pearson's close proximity to Brampton gives us a definite advantage when it comes to attracting global companies to our City,” said Mayor Linda Jeffrey. "A major multi-modal transit centre serving the western GTA, located at our airport will provide a critical connection between Brampton and the rest of the world." The GTAA’s proposed transit centre located on airport lands will help to address the low transit mode split in the area today with only 10 per cent of people taking transit. The centre will potentially connect a number of transit lines that are already in development or have been proposed by various levels of government, including: Eglinton Crosstown West LRT; Mississauga Bus Rapid Transit; Finch West LRT; Regional Express Rail on the Kitchener line; and the Province of Ontario’s High-Speed Rail concept. The centre, proposed to be located across Airport Road from Terminals 1 and 3, with access from Highways 409 and 427 and from Airport Road, will be at the heart of a new mixed use commercial area that will include office, retail, hotel and other commercial space. The vision for the area around the transit centre calls for improved streetscapes through sidewalks, landscaping, and improved lighting. 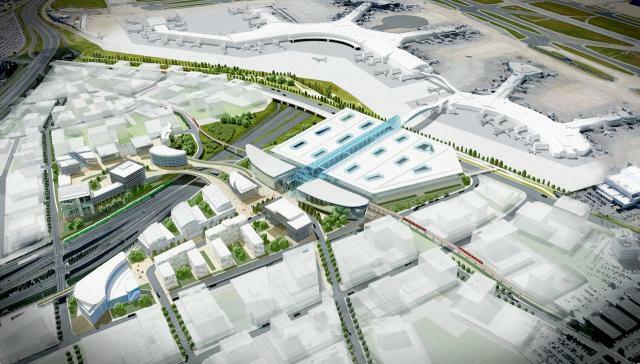 The GTAA has held preliminary discussions with all levels of government to raise awareness about the opportunity for the regional transit centre at Toronto Pearson. It anticipates continued planning discussions throughout 2017 both for the centre, as well as for the individual transit lines that will connect into the centre. “Better connections regionally and around the world boosts the competitiveness of Brampton businesses,” said Todd Letts, CEO of the Brampton Board of Trade. “Toronto Pearson's vision for a multi-modal transit centre will be an important driver for the development of our local economy."